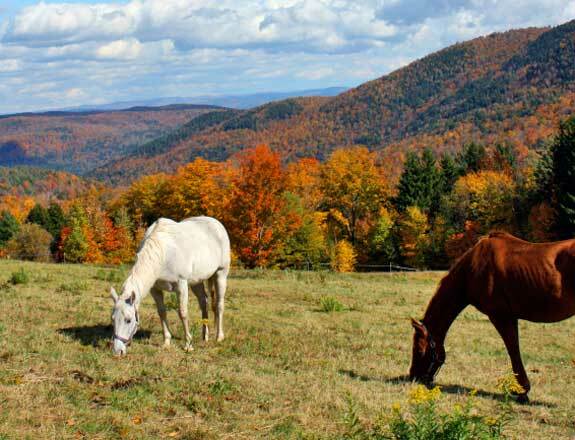 Fall trail rides offer scenic views of Maine's fall foliage. People travel with their dogs, cats, even birds. But you are a horse lover, and your four-legged friend just happens to be considerably larger than a St. Bernard. Bring him along with you on your next Maine vacation so you can both enjoy the beautiful countryside. Boarding stables are available, as are a few places for both you and your horse to spend the night. Just imagine, you and your larger-than-Fido best friend cantering along a park trail or a pathway in sight of the Atlantic Ocean. If the closest you’ve even been to one of these four-legged wonders is the painted ponies on a carousel, no problem. Take a quick lesson on a rented pony and then a ride along one of Maine’s scenic trails. You will have a memorable experience, and maybe even a new apple-munching best friend. 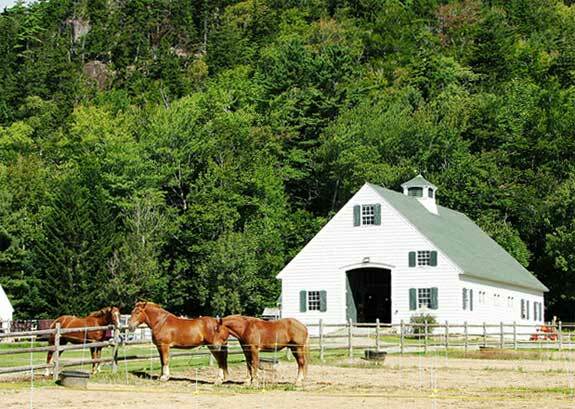 One of the most horse-friendly locations in all of Maine is Acadia National Park. John D. Rockefeller, Jr. was a big fan of the park and he loved to travel by horse drawn carriage. In 1913 Rockefeller started the task of building 45 miles of carriage roads so he could ride about without being “harassed” by the new-fangled horseless carriages. Most horses didn’t like the noisy, sometimes smelly contraptions and would shy or even bolt. Rockefeller also wanted to preserve the natural beauty of the park. Today riders are welcome to ride their own horses on this network of roadways. Motor vehicles are still not allowed, except for the occasional park service vehicle. Since the roadways were graded for carriages, they are gently sloped, so even the novice rider can take part. Rockefeller also positioned the roadways to take advantage of the lovely coastal and ocean views. Carriage rides are still available, offered by Wildwood Stables, a park concessioner. The firm also offers space to park horse trailers as well as boarding for horses. They do not have animals for rent. Wildwood Stables operates a campground, reserved for those traveling with horses. Winter riding is allowed, but keep in mind the horses may have to deal with snowmobiles, which do tend to be a bit loud and sometimes appear out of nowhere. In addition to Acadia National Park, Maine has a number of horseback riding trails. The Aroostook Valley Trail offers 75 miles of shared use trails in the northern end of the state. Other locations offering shared or multiple use trails include Mt. Blue State Park, Bradbury Mountain State Park, the Kennebec Valley Trail, Phair Junction Trail and the Lagrange – Medford Trail. Examples of equestrian only trails include the 7.2 mile pathway at Hollis Equestrian Park and the 14 mile Jay – Farmington trail that wanders through the western hills and is especially scenic when the fall colors are at their peak. The 18-mile long St. John Valley Trail, near the Canadian border, is another peak color wonder. Maine’s excellent highway system makes pulling a horse trailer easy. Once you arrive, boarding stables are available at places on or near the coast as well as farther inland. Example locales are Hancock, just inland from Acadia National Park, and Hulls Cove at Frenchman Bay near Bar Harbor. Head inland a bit and stables are available in Belgrade next to Messalonskee Lake. Those looking to travel in the Sebago Lake area will find stables in Naples. A few stables have gone the extra step and invite you to spend the night along with your horse. One stable in Fort Fairfield near the Canadian border offers RV and tent camping along with horse boarding. Prices vary according to type of stall or corral and whether feed is required. Other facilities offer bed and breakfast stays for you and your horse. You get a real bed; the horse gets the stall or corral. Locales offering this type of arrangement include Monmouth, Brownfield and Hancock. It is possible to rent a horse and even take a lesson or two before you set off on a leisurely trail ride through the woods or along the coast. Depending on the stable, you may be able to learn English or Western riding skills. Western saddles are larger, with more of a seat and a large saddle-horn to grab onto if needed, and are perhaps better suited for beginners. Sample of trail-ride-only prices include one-hour adventures for beginners, at roughly $65 per person and more advanced two-hour rides at $100 per person. Lessons average from $30 to $50 per hour depending on locale and season. Some horse stables offer week long summer riding camps, with or without overnight stays. These include lessons in horse anatomy, caring for horses as well as learning to ride and otherwise control a horse. Prices vary depending on stables, age of participant and whether you are boarding onsite. One facility, Angels Dancing with Horses Therapeutic Riding in Augusta, specializes in lessons and camps for the physically challenged. If going on a trail ride or participating in a camp, you should have footwear with heels, meaning boots not sneakers, long sleeved shirt and long pants such as jeans. Leave the tank tops and jewelry at home, or in the car. Riding stables usually provide a helmet if you don’t have your own. Bring along a sense of humor and an “I can do this” attitude. It is after all, just a horse, of course.